Scottish offshore drone firm Cyberhawk Innovations has surged into the black after a huge jump in sales. 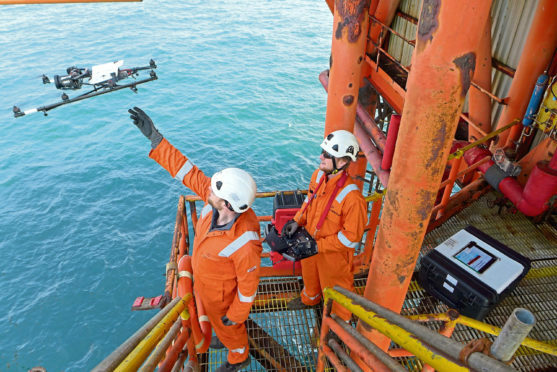 Cyberhawk, whose unmanned aerial vehicles (UAVs) are used for aerial inspections on a growing number of oil and gas installations, and increasingly by renewable-energy, utility and transport infrastructure customers, enjoyed its most successful year to date during the 12 months to March 31. The firm highlighted operating profits of nearly £700,000, compared with losses of about £540,000 a year earlier, on a 34% jump in turnover to nearly £4m. Pre-tax profits for the latest period came in at £549,389, against losses of £663,521 previously. Cyberhawk expanded its team by 26%% to 53 people, while a further seven have joined since the year end. Chief executive Chris Fleming is just as satisfied by other milestones achieved by the firm in the past year or so. It increased its global business, with overseas revenue now accounting for 35% of total turnover and rising. The company completed its first projects in the Caribbean and Mediterranean during 2017-18 and its US arm, Cyberhawk Inc, trebled turnover following the opening of an office in Houston. Cyberhawk is also seeing increased demand for its proprietary visual asset management software, iHawk. The firm – headquartered in Livingston, with satellite offices in Aberdeen, Houston, Malaysia and Abu Dhabi – has completed in excess of 30,000 UAV flights in more than 30 countries since its foundation in 2008. Major clients include ExxonMobil, ConocoPhillips, BP, Shell, SSE, Network Rail, Siemens and National Grid USA. Other highlights in 2017-18 included a “world first” inspection at a US nuclear plant, accreditation from the American Bureau of Shipping for its internal tank inspection solution and the firm’s lead role in the development of UAV industry guidelines. Cyberhawk won the best safety improvement accolade at the 2017 UK Energy Innovation Awards, while it also scooped the venture-backed management team of the year title at the recent BVCA Scottish Management Team Awards. Mr Fleming said: “We are extremely pleased with the progress made in our last financial year, which has been bolstered by a number of major achievements and successful development of some industry-changing solutions. “We have spent the last 10 years proving that drones generate major efficiencies in terms of cost, time and safety, and it has been encouraging to see the number of operators embracing this technology rapidly increase. Collecting asset data is just one part of the puzzle, however, and efficiencies can be driven even further by using this data to its full potential.